Builder of Great Chalfield - Page 5. 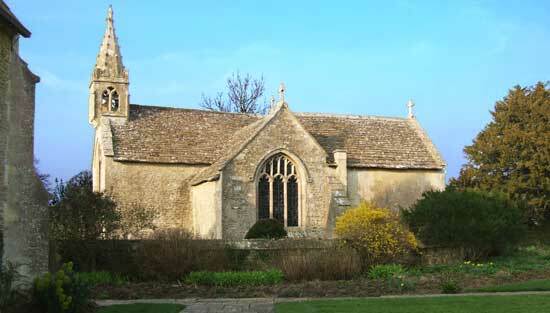 This parish Church stands beside the manor. Its nave dates from 1316-1349. 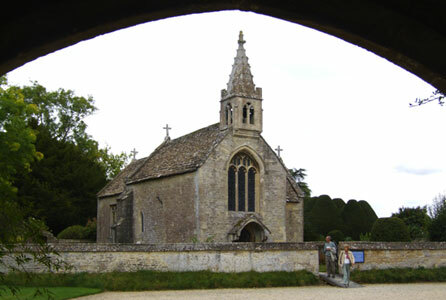 He considerably beautified it by adding a spire, and bellcote, a panelled porch and the chapel on the south side, connected to the nave by a fine screen with all the family armorial bearings on it, as described on page three. Nikolaus Pevsner in the volume on Wiltshire in his great series of studies of all the counties begun in 1951, The Buildings of England (p 257) dates this at about 1480. 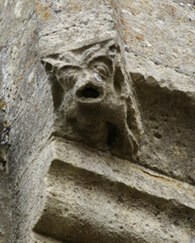 This suggests he may well have completed the manor before his additions to All Saints’ Church. We only know about the paintings in the side chapel from a description by an 18 th century vicar of the church, John Lewis. From the long list of stories of saints available he chose two that were extremely colourful, which was in character. There were episodes on one side from the heroics of St Katherine of Alexandria, doubtless chosen by lawyer Thomas because she was the patron of barristers and perhaps also because she shared her name with Tropenell’s de Percy ancestor to whom he owed so much – perhaps a forgivable case of ‘if you’ve got it flaunt it’, or more kindly evidence that he was very conscious of status and also proud of his wife’s family’s rank. However neither William Ludlow, her father, or Tropenell himself chose to take up the knighthood to which as landowners with property worth more than £40 a year they were entitled - perhaps because of what they saw as the needless expense this entailed. It is less clear why, for the other side of the chapel, he chose some gruesome episodes from the life of the patron of sailors, St Erasmus of Antioch. He was put to death by having his intestines wound out of his body by a windlass, hence the connection with the sea. Perhaps St Erasmus was chosen because he was often prayed to by those with stomach ache! The story of the last twenty years of his long life, lived out in comfort in his manor, is all of a piece with what came before. When he died in 1487, aged 82, he disposed of his property and possessions in a characteristically fair and thorough way, with provision for a priest to pray not only for his soul but also for the souls of the first two Lords Hungerford, Lady Margaret and her grandson. 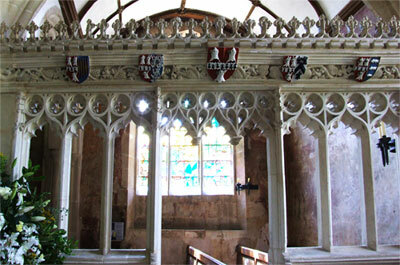 There were also gifts to various churches, and two silver candelabra and a Missal to Robert Cheverell, his old friend. 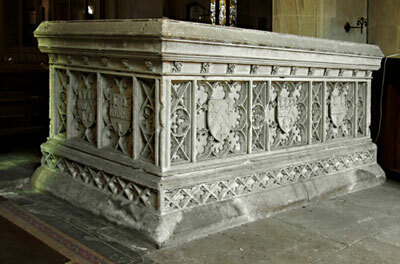 The tomb of Tropenell and his wife in St Bartholemew’s, Corsham is a fitting memorial but his manor with its parish church and his cartulary are the best things he left. In Thomas Tropenell’s case the family motto fitted the man very well. ‘Le jong tyra belement’, the yoke pulls well – indeed. Davies, Rev. J. Silvester, ed., ‘The Tropenell Cartulary’, Wiltshire Archaeological and Natural History Society, 1908. Vols. 1 & 2. Driver, Dr. J.T ‘The Career of Thomas Tropenell’, Magazine of the Wiltshire Archaeological and Natural History Soc. Vol. 93 2000, pp 82-89. Biography of ’Thomas Tropnell’, Oxford Dictionary of National Biography, OUP Sept 2004, (on line edn Jan 2008). Dawson, The Victoria History of Wiltshire, Vol 7, entry on Great Chalfield. University of London Inst of Historical Research. ‘The History of Parliament 1436-1509’. HMSO 1936, entries on Thomas Tropenell and William Ludlow. Clark, Dr L.S. ‘The History of Parliament 1422-1461’, as yet unpublished, article on Richard Erle(y), June 2008. Floyd, R.C. 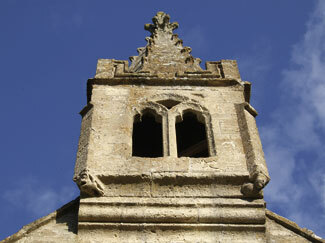 ‘All Saints Parish Church, Great Chalfield’, A Guide to Visitors, May 2001. Garnett, Oliver, ‘Great Chalfield Manor’, The National Trust Souvenir Guide, 2007. Harriss, Gerald. ‘Shaping The Nation 1360-1461’ The New Oxford History of England. OUP 2005 Kightly, Charles. ‘Guide to Farleigh Hungerford Castle’, English Heritage Guidebooks, 2006. Walker, T. L. ‘The History and Antiquities of the Manor House and Church at Great Chalfield, Wiltshire’, 1837.